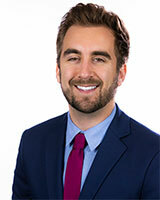 Brandon Johansen joined the ABC30 Action News digital team in December 2018 and is happy to be back in Fresno. A Fowler High and Reedley College alum, Brandon grew up in Fresno County and returns home after going to college in Phoenix and working in Bakersfield. Brandon graduated from the Walter Cronkite School of Journalism at Arizona State University with a bachelor's degree in journalism and mass communication. During his time in Phoenix, Brandon interned at Fox Sports Arizona and reported for the college television station. After graduation, Brandon went to KERO-TV in Bakersfield, where he worked for nearly three years as a general assignment news reporter and weekend evening anchor. While in Bakersfield, Brandon reported on key Central Valley issues and was nominated for an Emmy award for his story about a Bakersfield cold case. He also worked as a fill-in weather forecaster and aided in producing content for the sports department. When he's not at work, Brandon loves watching sports (especially baseball), catching the latest hit movie, tracking down the best tacos the Valley has to offer, and spending time with family and friends. A program at UC Merced is looking to solve two issues at once: food waste and food insecurity. Investigators say the 17-year-old driver who was killed drifted into the oncoming lane, but they're unsure why. A woman is being treated for serious burns and fire crews are cleaning up a three-alarm apartment fire in central Fresno. The Chowchilla Police Department made sure their animal control officer felt the love during National Animal Control Appreciation Week.